Red velvet by Gruel, with 2 clasps and metal squares having a dolphin and anchor in center, in maroon morocco case lettered: Horae - Ms. - Franco-Italian - XVIth century. Purchased by J. Pierpont Morgan (1837-1913) from Val. Blacque in 1905; J.P. Morgan (1867-1943). 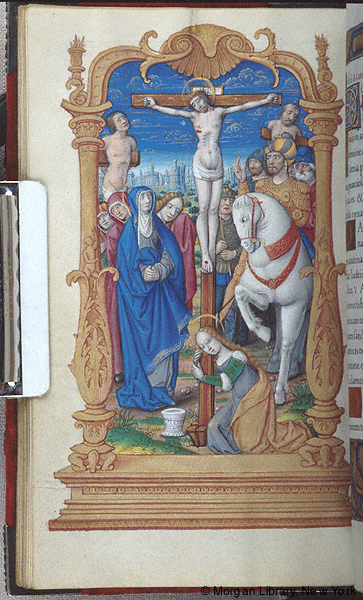 Ms. book of hours for the use of Rome (Hours of the Virgin, Office of the Dead); written and illuminated in Paris, France, ca. 1510-1520. Decoration: 16 large miniatures, 33 small miniatures, 12 calendar illustrations. Artist: Jean Pichore (formerly called the Master of Morgan 85). Two illustrations on fol. 53v (Presentation) and fol. 84v (Job) are based on the same subjects in the Briçonnet Hours (1483-91) by Jean Poyer (Haarlem, Teylers Museum, ms. 78). See R. Wieck, "Post Poyet," Excavating the Medieval Image, 2004, p. 249, figs. 11.1, 11.2.